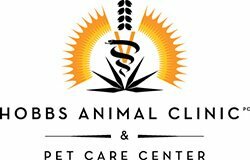 Hobbs Animal Clinic, PC is proud to serve Hobbs, NM and surrounding areas. We are dedicated to providing the highest level of veterinary medicine along with friendly, compassionate service. If you have any questions about how we can care for your pet, please don't hesitate to call us at (575) 392-5563. Thank you! We have been here!!!! We adopted a cat from here and she has been a wonderful addition to our family!!!! We named her Pixie!!!! My son is just in love with her!!!!! We just wanted to say a big Thank you to the Hobbs Animal Clinic and shelter!!!!! We were traveling visiting our son and our little pug came down with a bad ear infection. The staff and doctor were the greatest if I could give them ten stars I would . If we lived here he would be our babies vet for sure!!!! Thank you for taking care of our baby!! Very clean and awesome place. The staff and vet are very nice. The vet was very thorough and really wanted to help my dog feel better. I even got a call the next day asking how my dog was. Amazing place!